Runaway championship leader Jake Byrne approached Mondello Park keen to take two solid results to give him an almost certain 2012 Championship victory. James Fleming however is a driver who has shown immense determination at every round so far this season and never one to give up on his own dream of becoming the Ginetta Junior Ireland Champion. While most of the focus in the championship this season has been at the very close battle at the head of the field, we’ve seen some fantastic performances from Andrew Clarke and championship rookie Jack Finlay. The newcomer racing with ABR has shown he is well capable of running towards the front of the field and has been consistently one of the best rookie drivers so far this season. Qualifying was once again a very close affair at the head of the field. With just over seven tenths of second splitting the top five drivers, it goes to show just how level the playing field is in this one-make championship, especially when two of the five drivers are still in their first season of racing! Out in front it was Jake Byrne who grabbed pole by just over one tenth of a second ahead of main rival James Fleming. Jack Finlay had put on a superb display to line up his ABR prepared car in third with Andrew Clarke putting his Murray Motorsport car in fourth with team-mate Dylan Curley rounding out the top five. Off the line for race one it was Byrne who got the best start to lead into turn one but Andrew Clarke was already mounting an impress challenge from the second row of the grid and was leading by the end of lap one with Byrne second, Fleming third and Finlay fourth. However Byrne who comes from an experienced motor racing family wasn’t going to settle in second and quickly found a way past to move into the lead on lap two. Finlay and Fleming were now locked in battle with the latter doing his best to reel in the gap to second placed man Clarke. By lap seven Fleming was now hot on his heels and found a way past to move into second. Byrne had now opened up a slender lead at the front of the field but Fleming was on fire and certainly wasn’t going to give up without a fight. Right up the final lap Fleming was doing his best to find a way past and on the run to the run to the chequered flag Fleming was along side Byrne in what would turn out to be a photo finish with just one tenth of a second splitting the pair with the win going to Byrne. Andrew Clark crossed the line in third with Jack Finlay, Sophie Byrne and James Huddleston rounding out the top six. Thanks to his superb run in the second half of race one, James Fleming set the fastest lap of the race and with it bagged pole for race two. A superb start put him right into the lead at the end of lap one followed closely by the ABR pair of Jake Byrne and Jack Finlay. Byrne who was competing in his last ever Ginetta Junior Ireland race as he turns 18 in August preventing him from taking any further part in this junior championship, was keen to ensure he secured enough points to ensure championship victory. He was putting Fleming under increasing pressure but their seemed to be no sign of any weakness showing from the young Tallagh driver out in front. Jack Finlay who was putting on another fine display this weekend was staying with the leaders and ready to capitalise on any mistakes up ahead to take his maiden victory. However Fleming looked very composed and controlled a superb lights to flag victory at the chequered flag. Jake Byrne crossed the line second with Jack Finlay getting his just reward for a good weekend in third. Dylan Curley put his race one non-finish behind him to finish fourth with Sophie Byrne and James Huddleston rounding out the top six. The final two rounds of the championship will be at the famous Leinster Trophy Race Meeting around Mondello Park’s International Circuit on Saturday 15th and Sunday 16th September. 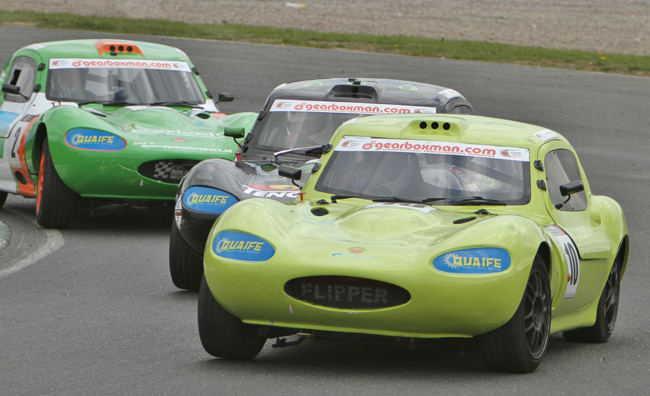 You will also be able to see some of the cars on display the Phoenix Park Motor Races on Saturday 18th & Sunday 19th August where we will be running a competition in the event programme for a chance to win a free entry to TheRace2Race.com Ginetta Junior Championship Scholarship with a top prize of a fully funded season in the 2013 Ginetta Junior Ireland Championship.